The Middle Zambezi, host to a rich biodiversity, is located in the central part of the Zambezi River Basin which covers eight Southern African Countries. The area is located downstream of three hydropower schemes. In the last decades, the floodplain riparian tree, the Faidherbia albida, vital for the local wild life, has shown a worrying decrease in its regeneration rates. 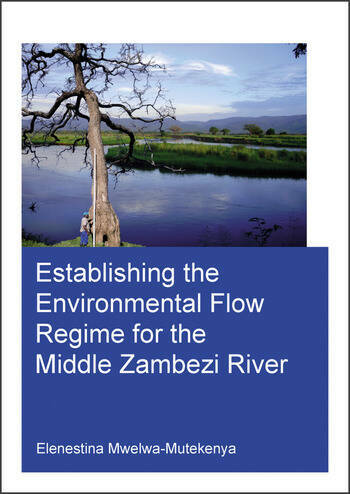 This thesis explores establishing the environmental flow regime for the Middle Zambezi reach in order to minimise the impact of the upstream hydropower schemes on the river environment, using the Faidherbia albida tree as a biological indicator. The research identified that the current dam operations have completely altered the natural hydrological rhythm from pre-Kariba dam dry season flows of 100-200 m3/s increasing to 1,000-1,500 m3/s. The sudden closure of the dam floodgates can be linked to the observed river channel-widening phenomenon. In addition, the Faidherbia albida tree now experiences longer flood residence over the floodplain, making it inaccessible to animals to allow for regeneration. In order to save the F. albida tree, a two-pronged environmental flow regime is proposed of releasing a moderate flood of 5,800 m3/s once in 5 years, for 5 to 6 weeks in the months of February to March, and phasing the spillway gates closure over a period of 3 to 4 weeks to keep the floodplain wet enough until the months of May and June. Phasing of the spillway gate closure would also mitigate the excessive bank erosion.